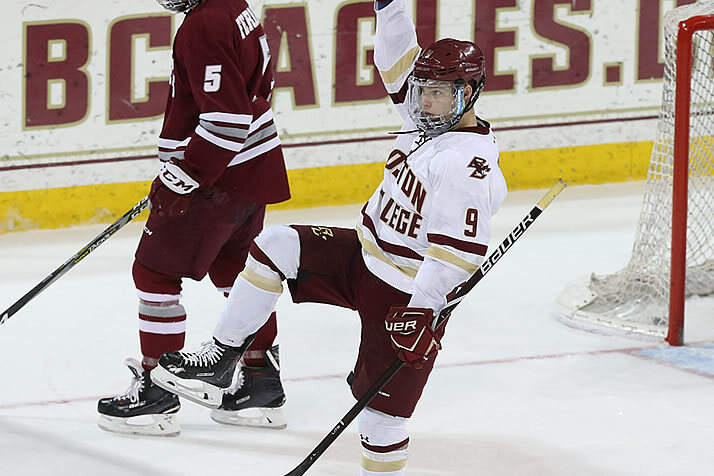 Notes: BC’s Freshman Force - College Hockey, Inc.
Eagles enter Hockey East tournament likely needing a title to reach NCAAs. Logan Hutsko’s 12 points in the last six games include a third-period hat trick in the Beanpot third-place game. Boston College enters the Hockey East tournament on a four-game winning streak and the regular-season champions likely need to win it in order to reach the NCAA Tournament. An impressive second half has lifted freshman Logan Hutsko (Tampa, Fla./U.S. NTDP) to the top of the team’s scoring chart. The draft-eligible Hutsko has 12 points in the last six games and has played all 34 games on the year after battling injuries the past two seasons, including a broken neck that cost him part of 2015-16. Wilson breaks through for Army – Army West Point welcomes rival Air Force for a quarterfinal series in Atlantic Hockey, one of several rivalry series that take the postseason stage this weekend. Michael Wilson (Fond du Lac, Wis./Minnesota Magicians-NAHL) leads the Black Knights in a breakthrough sophomore season, posting 17 goals after a 4-goal rookie season. Wilson ranks among the nation’s leaders in power-play goals (9, t-6th) and game-winning goals (5, t-2nd). Shepard guides UMD – After starting 7-9-2 (2-7-0 in NCHC), Minnesota Duluth has been one of the nation’s best second-half teams. Sophomore goaltender Hunter Shepard (Cohasset, Minn./Bismarck-NAHL), who had an .897 save percentage on Dec. 8, has posted a .942 mark since then, which ranks third nationally in that time. The former NAHL and Minnesota state high school goaltender of the year made one start last season behind classmate Hunter Miska but has assumed the starting role after Miska signed with the Arizona Coyotes. NMU’s turnaround – First-year head coach Grant Potulny and Northern Michigan host Bowling Green with a spot in the WCHA championship game on the line. The Wildcats, who last year finished eighth in the conference, enter the series at 23-13-3, their most wins since 2002. They feature a pair of 40-point scorers in juniors Adam Rockwood (Coquitlam, B.C./Coquitlam-BCHL) and Troy Loggins (Huntington Beach, Calif./Sioux Falls-USHL), plus three other players with more than 30 points. Vets lead Knights – Clarkson boasts the No. 2 offense in ECAC Hockey and much of it starts from the Golden Knights’ defense. Senior defensemen Kelly Summers (Golden Lake, Ont./Carleton Place-CCHL/OTT) and Terrance Amorosa (Kirkland, Que./Sioux City-USHL/PHI) lead the way and make Clarkson one of two teams nationally (with Michigan) to feature multiple defensemen with 25 or more points. Summers and Amorosa are the only NHL draft picks on the roster and the only upperclassmen among the Golden Knights’ top nine scorers. They lead Clarkson in pursuit of its first ECAC Hockey Tournament title since 2007, beginning with a home series vs. Colgate this weekend. Ohio State’s Big Ten semifinal game will be played at Nationwide Arena (Sat., 7:30 p.m., BTN), the ninth NHL arena to host an NCAA Division I men’s game this season. The NCAA Tournament Selection Show is 11 days away, slated for 12 p.m. ET on Sunday, March 18 (ESPNU, TSNGO) … UNH will formally introduce Mike Souza as the school’s new head coach at a press conference next Wednesday, March 14 … Quinnipiac and Sacred Heart were the only two road teams to win playoff series last weekend … Follow postseason professional signings on our Pro Signings page.